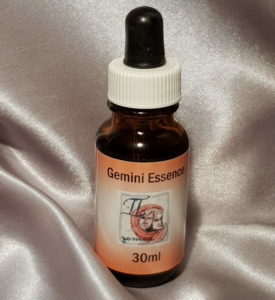 Gemini Essence is the third in our Star Sign Range. Also the third sign of the Zodiac Gemini The Twins Ram (21st May – 20th June) represents the duality of the Gemini nature. Gemini is the sign of adaptability, flexibility, intelligence, eloquence and communication. Geminis are sociable and light-hearted, although they can be changeable and too easily influenced. Karma in the realm of Gemini usually centres around untruths or nefarious schemes. Past negativity may involve gossip, slander, betrayal or misinformation and deliberate deception. The present-life karmic challenge is to identify the truth and stick by it.